I wanted to participate within the ordering process which may sound silly but if I am to fully recommend any service and go on to recommend it to my readers I need first hand experience. Nuts I know. Anyway I can honesty say the delivery process is beyond speedy - I placed my order on Tuesday afternoon and was greeted by my goodies this morning. Impressed? You bet I am. In case you are unsure The Lush Kitchen is a fairly new concept - well hand making products is not at all new for Lush, nor is super fresh ingredients but having a stand alone kitchen that rustles up custom, old but retired favourites and entirely new products daily, in such small and limited edition batches is brand spankingly new. In a way it is almost like a Lush store within a Lush store as you can only purchase Lush kitchen items online and it really is a case of when it's gone, it's gone! Basically the Lush Kitchen is a small team that work daily to create each product daily before uploading them online for those with the fastest fingers to the buzzer to order. This time around I purchased a bottle of Lush Fruity Beauty Shower Gel which as the name suggests is a fruity concoction - packed with fresh pineapple juice, vodka, lemon and lime. The idea is that the fresh pineapples, fresh lemon and lime oil contain enzymes which gently exfoliate and brighten your skin. it also contains soothing and cooling aloe vera gel making it the perfect summer shower buddy. 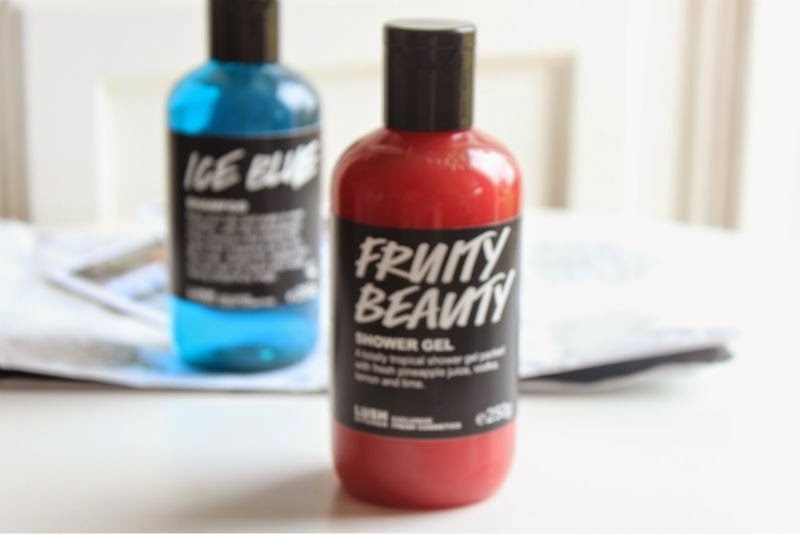 As my goodies arrived at 8am this morning I was able to enjoy them in my morning shower and in my opinion Lush Fruity Beauty Shower Gel smells like summer holidays - it has a hint of alcohol combined with tropical fruits which reminds me of cocktails, the beach and sunbathing, perfect for a rainy day like today when the beach seems a lifetime away. I am having a difficult time with my hair and scalp at the moment - my hair is growing at a super fast rate but shedding lots which the doctor has said is normal for this time of the year. 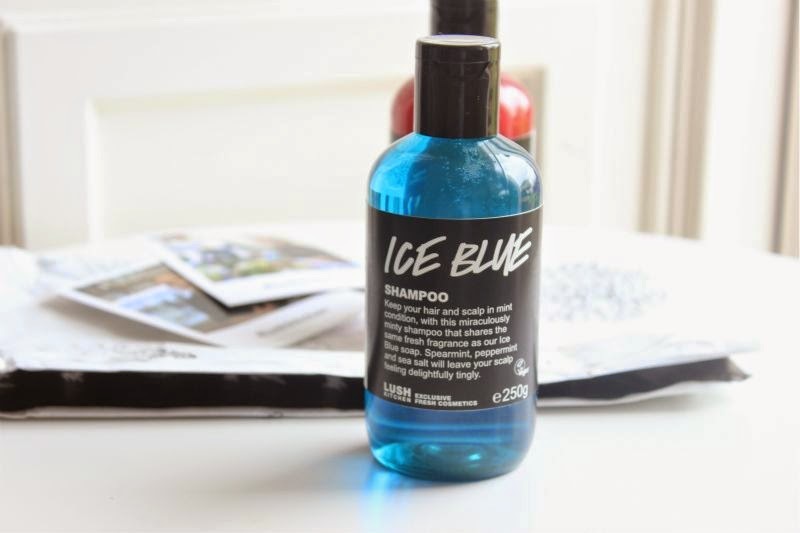 The humid heat of the last two weeks has also resulted in an itchy scalp so when I saw that the Lush Kitchen had cooked up a batch of Lush Ice Blue Shampoo I snagged one instantly. This shampoo really cleanses and soothes the scalp from the first wash and here is how it does it! 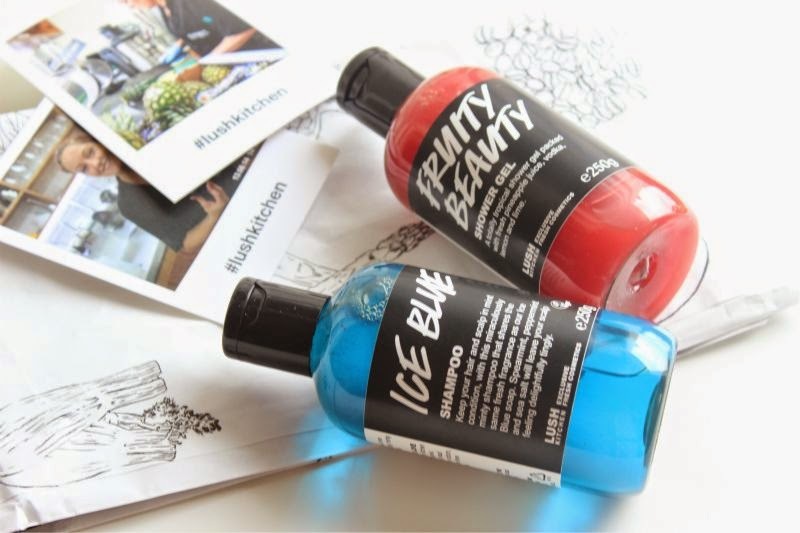 Not only does the Ice Blue shampoo share the same fresh fragrance as the Ice Blue soap but it contains menthol which is great for the scalp. It can help to combat hair loss, it's stimulating and boosts the scalps circulation too. It is so cleansing and refreshing that I am already looking forward to my next shower (how sad am I?) . Oh and also this shampoo is made with sea salt so if you're hot it will cool you down naturally. How clever! You can purchase both items here - link but I do warn that they sell out rather quickly! I've heard that the postage charges for Lush Kitchen are very unreasonable. Do you think they're worth it?